Do you want to learn more about who Jesus really is? 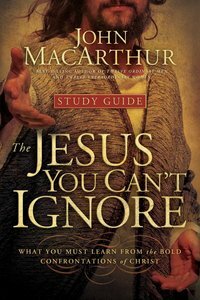 In The Jesus You Can't Ignore, author and pastor John MacArthur reintroduces a critical aspect of the Savior that has seemingly been forgotten. Yes, the Savior tenderly held little children in His arms but He also violently overturned tables in the temple. He gently touched a blind man's eyes but He scourged pompous thieves with a whip. His words soothed grief-stricken parents and angered the religious establishment of His day. Rewind, reflect, and react sections to increase your knowledge and inspire new action. Verse by verse, John MacArthur unpacks the Jesus Christ the Bible presents. Page by page, you will reach new conclusions about the Jesus too often overlooked. Discover a vivid portrait of the Messiah as He really is! About "Jesus You Can't Ignore (Study Guide)"